High Voltage Diving - Big Marine Animals! Manta Rays, Dolphins, Whale Sharks, Bait Balls, Up to 10 types of Sharks & Largest Biomass. the water is warmer ( around 78 degrees ) with the best visibility ( about 100' ). We have been exploring this magical place for over 20 years. We have chosen this exceptional vessel, Nautilus Belle Amie, for this adventure. 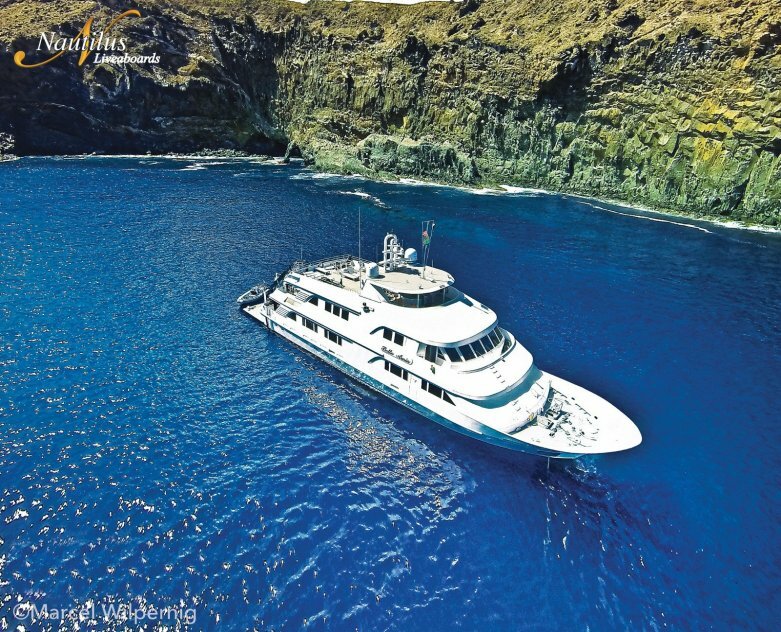 The Belle Amie is the newest and largest of the Nautilus liveaboards. She feels like a five-star floating boutique hotel, boasting spacious salon and dining areas, as well as a second open-air bar on the sun deck, expansive dive deck and, of course, a hot tub. Non-refundable Deposit of 10% of the cabin selection. Book Now to reserve your space on this adventure! Can't make this trip? Beaver Divers is a Nautilus representative and we can book your trip on any of the Nautilus vessels anytime that is convenient for you!